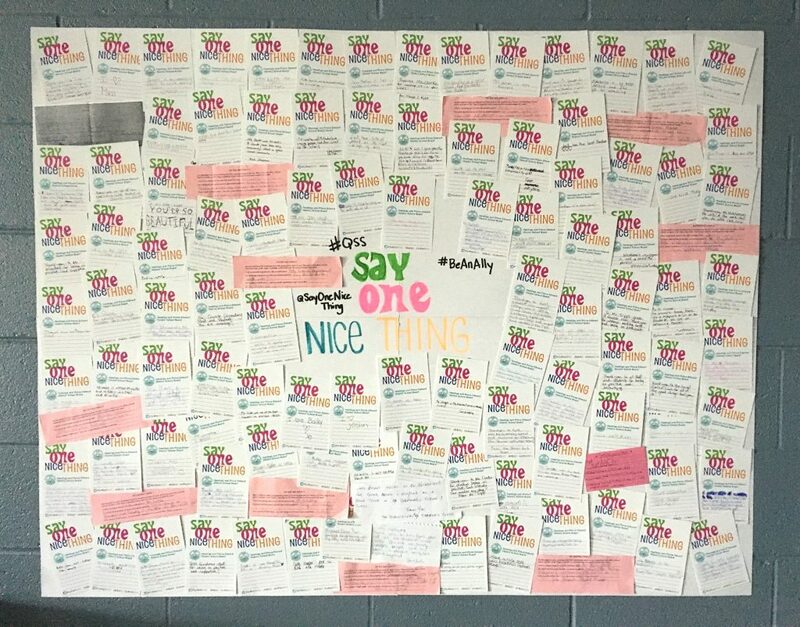 BELLEVILLE – Students learned how saying one nice thing could be enough to support a safe and accepting learning environment. 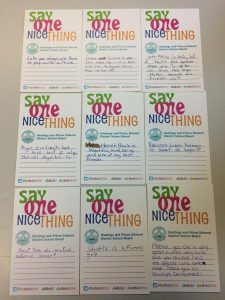 From Nov. 21 – 25, Hastings and Prince Edward District School Board launched its Say One Nice Thing campaign to promote Bullying Prevention and Awareness Week. Students wrote a positive comment about themselves, their peers, and the school on postcards each morning to start their day off with kindness. Brianne Tripp, teacher at Quinte Secondary School, said the postcards were read over the announcements every day to share the positive comments. “It promotes that positivity, being kind to others, and treating everyone with respect. It’s also recognizing that when people do kind things, they don’t go unnoticed,” she said. The postcards were then displayed as a mural at the end of the week to be viewed throughout the school year. Other activities, like motivational assemblies, were held. 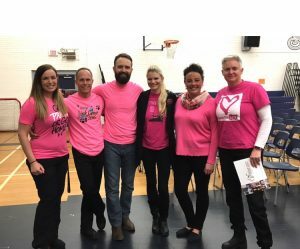 Youth motivational speaker Nick Foley visited Quinte Secondary to get the students excited about standing up against bullying. Students and staff applauded the positive energy Foley was able to bring to the school. Activities like pink shirt day and promotional videos kept the campaign running through the week. Kerry Donnell, communications officer for the school board, received an award of excellence in October from the Canadian Association of Communicators in Education, for creating the campaign that’s been successful for its third year.